It's simple, but often ignored advice: Fix your drafty windows. You're paying for heat. Do you want to see your money drift out the window? I don't think so. I'll explain the easiest and cheapest ways to stop drafts. I'm a carpenter and I fix windows all the time. Trust me, it's easy. Read on. When a window is installed, the opening needs to be a bit larger than the window itself. This allows the carpenter to simply place the window in the “RO” (rough opening) and use shims to secure it plumb and level. In many old homes, trim was then installed with this air gap unsealed. Later, as homeowners became more energy conscious, they stuffed insulation into cracks and openings. While more effective than nothing, this method never achieved complete air sealing. In modern building (and as a method to seal older windows) expanding spray foam is now widely used to seal these gaps. I would have to put “Great Stuff” (spray foam insulation) on the Top 10 list of awesome home improvement technology. The most common trick to sealing older window openings is to pop off the interior trim and inject spray foam into the gaps between the window jam and the framing. It's easy using the handy spray tube that comes with this miracle product. In addition to sealing the gap, caulking exterior and interior trim provides even more resistance to air loss. In the case of exterior caulking, added protection from water intrusion is also achieved. The second type of window air leak is due to the seals in the operable parts of the window. Here, older windows often had simple wood components and the fit was never very tight. Adding foam weatherstrip is pretty easy. Storm windows, adhesive weatherstripping and heat shrink window films also help. These are normally installed on a seasonal basis and provide an additional barrier to the elements. Other thermal losses occur via non-leakage channels. Heat can literally get conducted right out of your house, often via the window frames. One of the most conductive types is aluminum-framed windows, which were very common in the 60’s and 70’s. I replaced a number of these when I remodeled my own home some years back. My old aluminum windows were also single pane, which allowed the glass itself to be a conductive channel. Wood and vinyl are much better at preventing these conductive heat losses. Modern windows are usually double or even triple paned with an insulating chamber of argon nicely sealed between the panes. This kind of construction contributes to a window’s U-value — a measurement of heat loss and area. It is a bit different from the R-values used for insulation. With U-values, a low number is better. Sitting next to a large cool window you can actually feel the “chill” as the colder air descends past you. That's convection. Common fixes for convective losses also involve heat shrink films and thermal blinds, which tend to keep these air movements from occurring. 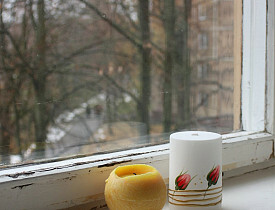 Replacing old drafty windows is one way to improve the heating and cooling budget of your home. But this improvement often comes at a high cost. Air sealing with spray foam and caulk, and insulating with shrink film or storm windows, can also improve your situation at a much lower cost. Kevin Stevens is a Networx writer.